This is a great version of the regular Gin and Tonic. Decorate the inside of the glass with some kiwi slices, retaining some to crush with the cucumber and honey for the base of the cocktail. 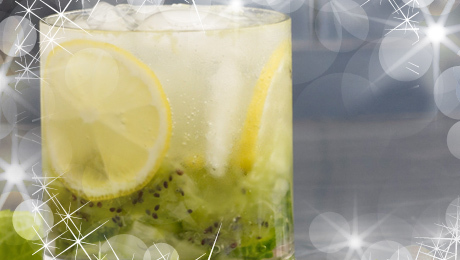 Place the crushed cucumber, honey and kiwi into the base of the glass and squeeze a little lemon juice into each glass. Divide the gin between the four glasses and top with some ice cold tonic water.